Children’s literature is a fabulous resource for teaching your child money concepts or initiating money conversations between you and your child. 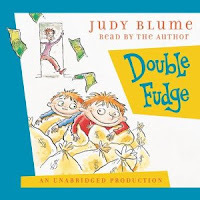 In this first installment of book reviews, I will discuss two books that are favorites of mine, Double Fudge by Judy Blume and Ramona and her Father by Beverly Cleary. Pete is a 7th grade boy living in New York City with his family. When his 5 year old brother, Fudge, discovers money, a series of adventures begins. Fudge wants to buy New York City and is determined to create his own money in order to make it happen. Fudge also has a shopping meltdown in a shoe store, tours the US Mint in Washington D.C. and breaks social protocol by asking everyone (and I mean, everyone) how much money they have. This is a charming, light-hearted look at a child’s introduction to the world of money. 1. Where does money come from? 3. The balance between doing favors for someone and getting paid for jobs. Ramona is a precocious 2nd grade girl who is having a rough year. Her father has lost his job and her mother has gone back to work full-time. The family is showing the strain of a reduced income and change in family lifestyle. Ramona wants to help by doing a TV commercial and getting paid a million dollars! She also tackles the job of getting her father to quit smoking. As a teacher and as a mother, I love to use books to teach skills and concepts. It is a great way to grab your child's attention and initiate conversations that extend far beyond the actual story. Do you have any favorite children's books that have money concepts embedded in the story? Please comment and share with us. Getting these out of the library this week! Our boys are huge readers and I'm always on the lookout for books that help reinforce money lessons. Let me know how you and your boys like them. My 8 year old thought "Double Fudge" was hysterical! I have to admit....I chuckled a good bit too. I am currently reading a few books for older teens. More info soon!